At AK Press, we’re always on the lookout for good kids’ books to distribute. One of the recent stand-outs was The Worms That Saved The World, which is always fun to hand off to a kid when we’re tabling somewhere. Here’s an interview with the author, Kevin Doyle, about how the ideas in the book were spawned by real-life struggles in Cork, Ireland. And if you’d like a copy of the book itself, just click here. 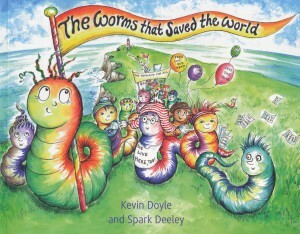 Q: The image on the cover of The Worms That Saved The World shows a big group of earthworms marching along a headland. There’s lots of them and they look happy. Some are holding placards announcing ‘We Live Here Too!’, ‘The Headland for All’ and ‘Free The Old Head’. So what’s this all about? Who are these happy protestors? A: This is a storybook for kids. We decided that a direct appeal to their natural rebellious instincts was what was required. In our book a community of earthworms must fight for their home and their lives. Struggling to win a better world brings them together so that’s in part why they’re happy. Also, in the end, they win too – so they are happy for that reason as well. Oops, spoiler alert there! A: No, but then the book market does need shaking up. All those celebrities writing children’s books is making things worse not better. Q: It’s a crowded market. A: Not content wise. Our book is about the environment and standing up for your rights. In reality there’s not that much around in the book-market that tackles those sorts of things and ideas for the age group we’re interested in anyway. Loads of books about princes and princesses of course! Maybe we can help reboot an old trend, fun books about rebellion. Q: The earthworms in The Worms That Saved The World are very cuddly. You could almost take them home with you. How did you come to choose earthworms for this story? A: The idea for the book came around the time I was reading stories to my own children. My daughter, Saoirse, had a wormery in the garden that had a glass window in it that you could look through and see what the worms got up to. To be honest the worms were always vanishing. They didn’t like being cooped up. So that was there that aspect came from. Q: Earthworms get a lot of bad press don’t they. You’re rehabilitating them? A: We’re big fans. Did you know that in one acre of land, there can be more than a million earthworms! I could go on. They are also essential to composting too. Listen, without worms this planet would be kaput. A: Obviously we have taken liberties. Our worms are able to do lots of things. They can read and write and they know how to draw up a manifesto. In addition they can do complicated maths calculations. Q: Brainy! There’s a long history of animals and species being used to point up some of the injustices in our world? A: Yes, by using animals or birds and plants one’s able to create stories that deal with all sorts of complex and interesting ideas. Children of course identify strongly with all sort of unusual birds and animals and their imaginations are open to these creatures doing this, that and the other. It’s lovely to write for children in that sense. Q: In your story the earthworms come face to face with a ruthless enemy. A: Yes. A bunch of greedy developers who buy their home and turn it into a luxury golf course. So ours is a bit of a David versus Goliath story in a sense. 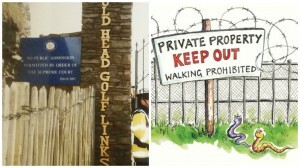 The golf club owners have no interest in anyone other than themselves and their clients. The worms don’t think that this is right and they ask for a meeting. Things start to downhill for the worms when the developers try to eradicate the worms. The worms realise that they must fight back. A: You have to read the book to find out! No, only kidding. As mentioned above there are lots of worms under the ground. They band together. Strength in numbers and all of that. Our worms are smart as well. They know that some of the other animals and birds living on their headland are being affected by the golf course development too, so they ask them for help! Q: There’s one scene I like a lot. The seagulls are moaning about the helicopters arriving on the headland. One of them is nearly blown out to sea. A: Yes, in our story the worms get help from the seagulls, the foxes and the badgers. The different animals and birds on the headland are affected in different ways. Even the ramblers are affected. They are prohibited from walking on the headland because if might affect the golfing experience. Q: The worms lead the fight on behalf of everyone. A: Sort of. One of the ideas that is explored in the book is the idea of cooperation. These days we often only hear about the survival of the fittest. But the anarchist Kropotkin explored the cooperative nature of life on earth and how interdependence and mutual aid that is also part of survival. So that idea is in our story. By cooperating we can overcome obstacles. It dovetails with the wider idea that it is crucial to respect the environment and not destroy life and diversity. Q: So is this an anti-capitalist book? A: Guilty as charged really. Our planet is now under extreme pressure. The pursuit of profits motivated by untrammelled greed – essentially that’s what capitalism is about – is at the root of this. The very world that we all rely and depend on is being exploited to the point of exhaustion. In our story that way of thinking is represented by the luxury golf course. We’re not suggesting that all golfing is the enemy, of course. But golfing as an industry is super exploitative in regard to land and water. Many golf course over-indulge in the use of chemicals, insecticides and pesticides too. There was a fine film made only recently about the luxury golf industry and the antics it gets up to. It’s called A Dangerous Game and is widely available. Well worth a look at. Q: I was reading that your book was inspired by a campaign to oppose such a development near where you’re from in Cork, at the Old Head of Kinsale. What happened there? 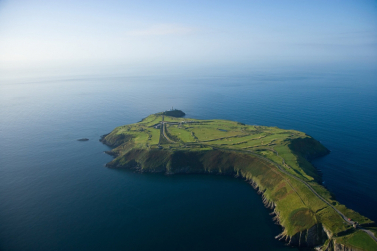 A: The Old Head is one of Ireland’s natural treasures for sure. A beautiful place, with walking trails and bird sanctuaries but now – since the 2005 – annexed for the sole and private use of a select group of well-heeled golfers. Q: I saw a promo for the Old Head of Kinsale on an Irish tourist film about Ireland’s Wild Atlantic Way, so how can it be annexed as you say. A: It is! It’s still heavily promoted as a site to visit but you can only look at it from a distance. Or take a cruise boat and tour around the seas off the headland. But no walking! Q: But it was open to the public once? A: Completely. Many people talk of it and walked there. Then in the late eighties the headland was purchased by a millionaire developer who had this dream of putting a luxury golf course on the headland. He wanted it to be exclusive and only for those who had a lot of money. He made no bones about this – it was his dream. And that’s how it is now. It’s €30,000 to join for a year. To play there for just the day costs a lot. So it was that and the campaign that emerged to fight the injustice that sparked the idea for the book. Q: What did the campaign actually fight for? A: For the right of the public to walk on the headland as they had always done. The public right of way was what was at issue. It was brave campaign, initiated by a coalition of socialists, anarchists and environmentalists. In was always going to be an uphill battle to win though. We were up against people with deep pockets. They went to the courts, took on Cork County Council and Ireland’s Planning Board and eventually they won. Once they did, the cops rowed in to enforced the rule of law. It was touch and go after that. We really needed more public support and it didn’t arrive. Even so I felt myself though that the campaign had a lot of very positive aspects to it. Q: What struck you as positive about the campaign? A: The willingness of people to defy the law. Unjust laws must be broken, we all know that but to go ahead and do it is another thing. The centre piece of the protests was a mass trespass. This involved a lot of people scaling a high wall to gain access to the traditional walks. It was quite amazing to witness these protests. Q: Why a children’s book as opposed to say a pamphlet or book about the campaign? It seems like that might have been an option too? A: I thinking standing back from the actual events at the Old Head itself, a children’s book about the issues is probably more valuable. It’s an investment for the future too. See, when the campaign was going on at Kinsale, I was a bit immersed in children’s books as I had young daughters. There are lots of great books about but you notice that the selection is narrow too. A: So many story books re-enforce and uphold traditional values. Right now those books dominate the book-market. Why? For me it’s plain, simple bias. Partly it is the market re-enforcing itself with the repetitive use of the formula books that work. But clearly there’s lot more to it than that as well. For example some recent studies have looked at gender roles. The video “The Ugly Truth About Children’s Books” is a great example. It’s on YouTube and well worth a look. A mum and her daughter remove books from a bookcase using the following criteria. Is there a female character? Does she speak? Do they have aspirations or are they just waiting for a prince? In the end there’s not a lot of books left for them to read. One bald fact tells you a lot: 25% of 5,000 books studied had no female characters at all. Q: And we wonder why women are sometimes less visible. A: Precisely. Across the broad range of children’s media, less than 20% of products showed women with a job, compared to more than 80% in respect to male characters. You don’t need to be a rocket scientist to work out what the situation in going to be like around topics poverty, exploitation or challenging authorities. It’s a very limited market in many ways. Q: Let’s turn to the illustrations. People have remarked on them. They are so vibrant and some on their own are almost stories in themselves. How did this come about? A: So Spark Deeley is the illustrator. 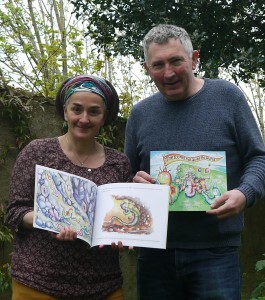 She has written and illustrated her own books. She worked on all the illustrations for our Worms book in her spare time. She did an amazing job. Q: Did you know one another and how did the collaboration begin? A: I didn’t know Spark at the time that I was thinking about the story idea. I actually looked around for illustrators who might have an interest but not that many did. I got to know Spark from a few protests that were happening around Cork at that time. Spark also attended the Free The Old Head protest picnics but I’m not sure if I met her at any of those. Here own book Into The Serpent’s Jaws came out and I knew from that about the quality of her work. So I asked her and she was enthusiastic from the outset. The key thing, I feel now, is that we had shared sense of what the story was trying to talk about. We are both socialists in that sense, from somewhat different perspectives, but with loads in common. In the time that we worked on the story we both grew to appreciate that books that elaborate on socialist and radical ideas are vital in a world that is increasing under the sway of neo-liberalism. Q: So you had the story idea and Spark was interested in doing the illustrations, what happened from there? A: It all took a long time really. Initially we looked into idea of trying to interest some publisher in it. We felt the environmental theme would be attractive to publishers but we had no luck. We must have sent out about twelve packages. That all takes time and money and you have to wait ages to hear back and often you never hear at all. Crazy. It was frustrating and we came away from it thinking it’s down to us. Publish or be damned sort of. We looked into ideas like of crowd-funding too but in the end we felt we could get the money together and publish it via Chispa Publishing. The big thing was for Spark to find time do the illustrations. The finished book is testimony to her commitment and talent. Q: What was the publishing experience like? A: It’s rewarding for sure but there’s a lot of work that you need to do to make it happen. There are lots of things that you need to get right too. We wanted tour book to be a quality book so we tried from the outset to hit a high mark with layout and printing. Lots of people read and looked at mock-ups of the book and made suggestions. We went to a few young readers too and asked them for their views. As the book was for them their views were especially welcome. A friend of mine who works as a copyeditor went thought the manuscript for us for free. Even with all of that the big issue is distribution. We’ve done most of the distribution in Ireland ourselves but we’ve been really lucky that AK Press, in Scotland and in the States, have taken the book under their wings. That’s a breakthrough for a small production like ours. Q: I saw a promo piece for the book and it went something like ‘Direct Action For Kids’. Did that raise any hackles? A: Surprisingly few so far. When it does get raised we’ve countered by reminding people about all the prince and princess books. Of course some people don’t see these as ‘political’ at all. The point in a way is that there are lots of values embedded in all children’s books. But I would say that, for us, the book is really a positive exploration of interesting ideas. The book presents a series of situations and scenarios: the luxury golf club owners actually try to eradicate the worms at one stage; the worms asking other animals and birds for help; the idea of having to stand up for your rights. If you are reading this book and you get to talk to the young people in your life about these sorts of things, it can’t be bad. Q: What has the reception been like so far? A: Very positive. It’s not easy to publish in today’s inhospitable book market but we think we’ve done quite well. Our launch in Cork was mighty. Lot of people turned up from various campaigns which have happened over the years. Our most recent news is that we are on the shortlist for this year’s Indie book awards in Ireland. So happy days!